1. In a small bowl combine the orange juice, honey, cinnamon and cloves; mix well. 2. Place ham on rack in a shallow roasting pan. Insert meat thermometer in thickest part of ham. 3. Bake, uncovered, in a 325°F oven for 2 hrs. or until meat thermometer registers 140°F, (about 15-18 min. per pound), basting with the honey glaze during the last 45 min. of baking. 4. Garnish with slivers of the orange peel, if desired. 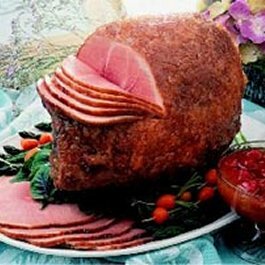 * Serving Suggestions: This ham recipe is perfect for a festive spring meal. The sweet honey-orange glaze adds just the right finishing touch. Serve with cornbread apricot stuffing, steamed new potatoes, asparagus vinaigrette, hot dinner rolls, and angelfood cake with fresh berries.